First off, please allow me to say that this post is in no way a compensated endorsement or advertisement for Adagio Teas; the thoughts expressed herein are strictly my own based on the fact that I love sharing great companies with terrific customer service with others who enjoy those same sorts of things, too! I first heard about Adagio when Amanda received a gift from a friend in the form of a bag of peppermint tea that she absolutely loved. She had apparently mentioned to her friend that she liked peppermint tea and lo and behold, a box arrived on the doorstep! Isn't it great to have friends like that? Amanda always raved about what a great tasting tea it was but not being a big fan of peppermint, I probably wasn't paying real close attention to be perfectly honest! Recently though I paid more attention when Caitlyn, my first cousin once removed who loves all things British and who is a major - and I do mean major! 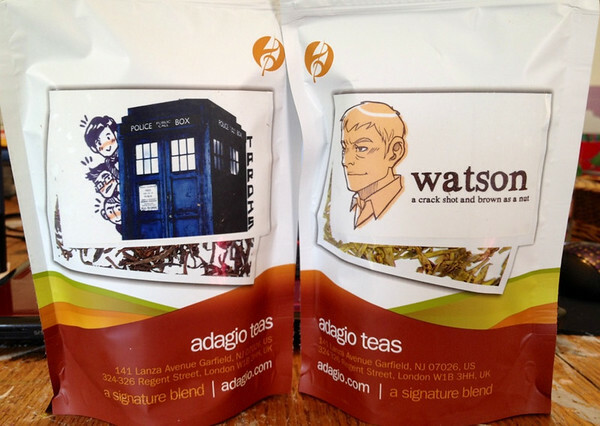 - Doctor Who and Sherlock fan, was offering her friends on Facebook $5 gift certificates for Adagio Teas where she had purchased the Watson Blend that she said was positively wonderful. Having become a bit of a fan of the show myself and fallen quite in love with Benedict Cumberbatch (Sherlock) and Martin Freeman (John Watson) then boo-hoo'd quite a bit during Season 2's finale (The Reichenbach Fall), I decided that I simply had to try a cup of Watson myself and took Caitso up on her offer of a gift certificate. Adagio offers all sorts of teas from black to chai to flavored to oolong to roibos and lots of others in between along with all sorts of blends that folks have put together. Additionally, should you not find a blend that you're looking for or that suits your fancy, you can create your own signature blend and if it turns out to be really good, others may very well order it and make it one of their favorites, too! It was through the "create your own blend" that the Watson Blend was born having been thought up by a gal named Cara Mcgee. I have no idea who Cara is but I can tell you that she definitely knows how to blend her teas as in addition to ordering a bag of Watson Blend, I also purchased a bag of Tardis Blend as Amanda owns a Tardis mug that I got her when she was attending Montserrat and what better thing to drink from a Tardis mug than a Tardis Blend of tea? I placed my order late Wednesday night for the two bags of tea shown above and had them in my possession Friday afternoon along with a nifty little gadget that I ordered called an "ingenuiTEA" which translated certainly must mean "brilliant device in which to brew your tea and not have to worry about spitting out leaves whilst drinking it" because that's exactly what it is! "The most convenient teapot you will find anywhere - we guarantee it. When tea is ready, simply place it atop your cup. This will cause a valve at the bottom to release: crystal-clear tea flows down, while the mesh filter retains all the leaves with one of the best infusers on the market. Super easy to clean and dishwasher safe. 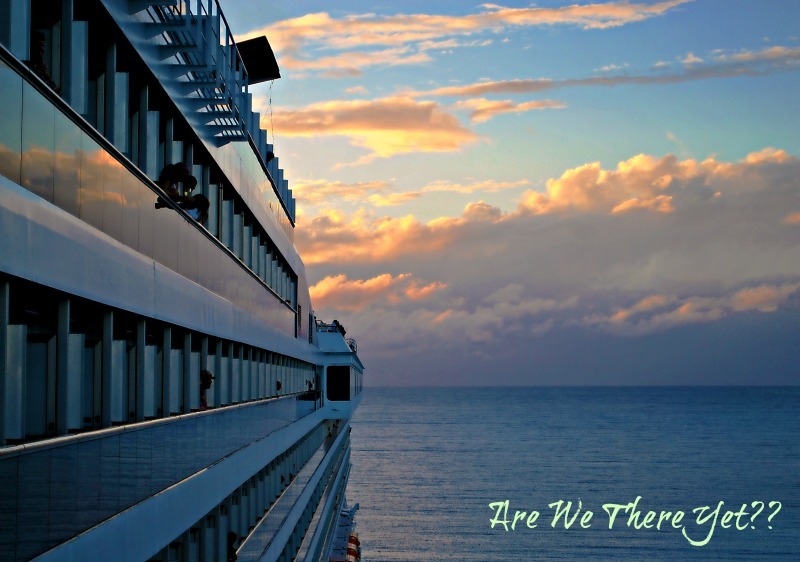 You will wonder how you got along without one." 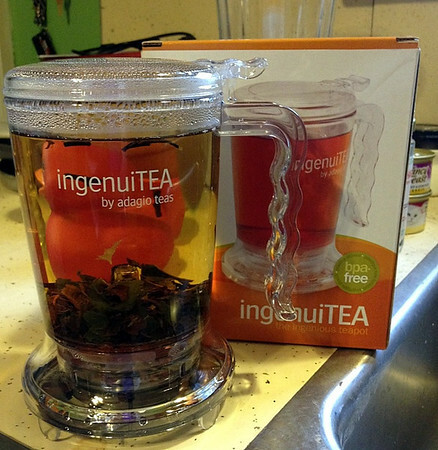 And indeed they are quite right, the gadget is absolutely brilliant and makes a truly wonderful cuppa tea! Or cups of tea depending on a) how big of a cup you like and b) what size ingenuiTEA you buy as they are available in both 16-ounce and 32-ounce sizes. I got the 16-ounce one myself as I figured there was no sense in going too crazy! For my first try using my new gadget I decided to give the Watson Blend a go and after dropping a few teaspoons of leaves into the bottom of the ingenuiTEA and then filling it with boiling water, I closed the lid and then stood back and watched as leaves of Cinnamon, Irish Breakfast, and Earl Grey Green steeped together to make one very aromatic cup of comfort. Four to five minutes later I took one sip and knew that Caitso was right - Watson was delicious! Amanda, of course, was anxious to try the Tardis Blend which was described as "tasting bigger inside the cup" which if you're not a Doctor Who fan and know nothing about the Tardis you won't get but trust me, to a Whovian it makes perfect sense! Made with Earl Grey Bravo, Blackberry, and Vanilla tea leaves, the Tardis Blend smells quite wonderful as soon as you open the bag and apparently tastes even better after it has brewed. However, when asked if she could tell me what the blend tastes like, the best Amanda could tell me was that "It smells really sweet but it isn't but it's really hard to describe which is fitting for a tea called Tardis and I really, really like it." No doubt drinking a Tardis Blend from a Tardis mug adds to the whole tea-drinking experience! 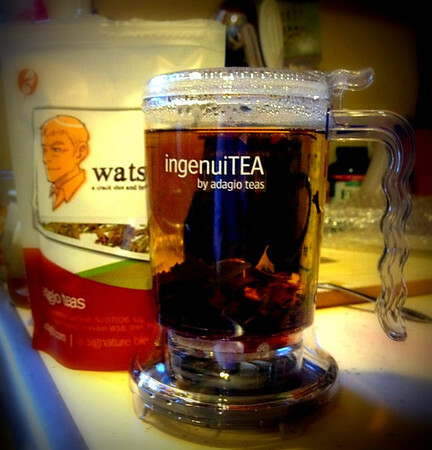 The collage of pictures above is my attempt to show you how the ingenuiTEA works as well as proof that it works on square mugs just as well as round ones should you happen to own your own Tardis mug! As it turns out, the 16-ounce size was absolutely perfect as it gives Amanda a full cup of tea with each brewing - which of course means she doesn't have to share the leftover tea with me as there is none left over! 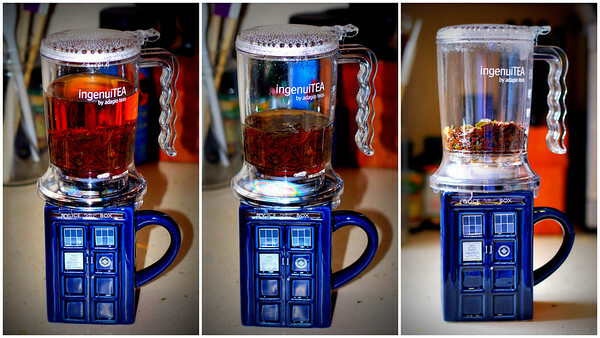 It's almost like the ingenuiTEA was custom-built for the Tardis mug! Brilliant! It's little things like that which make me think that a company has learned the fine art of customer appreciation and isn't afraid to practice it and that makes it a company that will get my return business again and again. The very reasonable shipping cost of a flat $3.75 for UPS Ground is pretty darned good, too and not cost prohibitive like a lot of other mail order places these days. 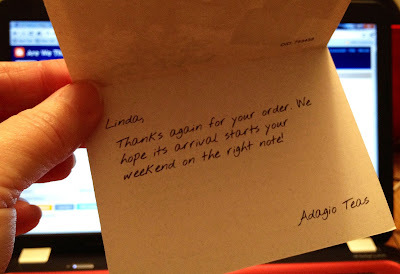 Trust me, I will be ordering from Adagio Teas again, especially considering that the Mycroft Blend has been calling my name! So, if I've sold you on a good company with a great product and excellent customer service and you've decided you'd like to give Adagio Teas a try yourself, I'd be happy to email you a $5 gift certificate good for your first purchase. Just leave me a comment saying you'd like one and if I've got your email address I'll send it right out; if I don't have your e-address, feel free to send it via the secure link in the right column up near the top of this blog and I'll make sure you get a gift certificate so that you too can enjoy a nice cuppa fresh and delicious tea whether you have a Tardis mug or not! some years back sarge and i went to england and i fell in love with tea for the first time ever. the coffee tasted like it was made with the dregs of an old ashtray so we went with tea in self defense! anyway i don't drink tea often enough. thanks. We are coffee folks here and about the only tea we drink, and not very often, is green tea. Glad you love this tea and even more happy that you are impressed with their customer service. We're not big tea drinkers, but if we were I can assure you that your post is an excellent recommendation. 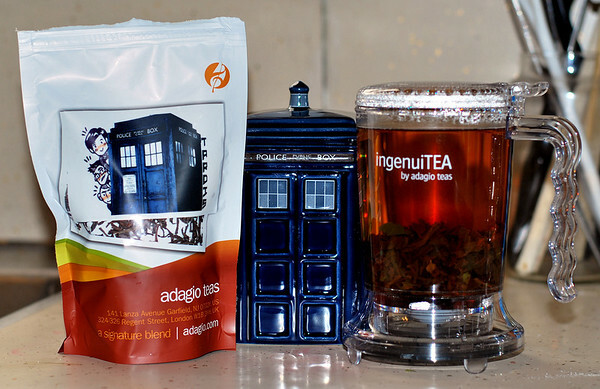 We would give Adagio a try, if we drank tea. I'd love to try them out! I spied a chocolate chip tea that sounds like its right up my alley. If you've got a GC to spare, I'd love to use it! this made me wish I liked tea! you should write copy for ad agencies and major manufacturers, you're really good! Would love your offer for a tea drinking friend who has a bday coming up. I do enough a cuppa occasionally myself. Great job on promoting the company!